R.B. Kitaj (1932–2007) was one of the most significant painters of the post-war period. His work defied the trend in abstract art prevalent in the 1960s and brought him to the forefront of British figurative painting. The Jewish Museum London and Pallant House Gallery, Chichester, are concurrently presenting the only UK showing of a selection of work from the major retrospective R.B. Kitaj: Obsessions, currently displayed at the Jewish Museum Berlin. The joint London/ Chichester shows are the first comprehensive exhibition of the oeuvre of Kitaj since his death and the first major retrospective in the UK since his 1994-5 exhibition at the Tate Gallery. 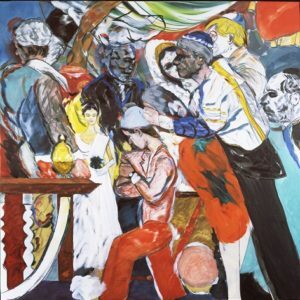 The exhibition at the Jewish Museum London features over 20 works in which Kitaj explored his Jewish identity, including iconic paintings such as The Wedding; If Not, Not; Cecil Court, London W2 (The Refugees) and The Jewish Rider. R.B. Kitaj, The Wedding, 1989-93. Tate. Presented by the artist 1993. © The Estate of R. B. Kitaj/Photo © Tate, London 2012. Discover more about the shows at both venues at our R.B. Kitaj: Obsessions website. Read or download the Press Release for the show. 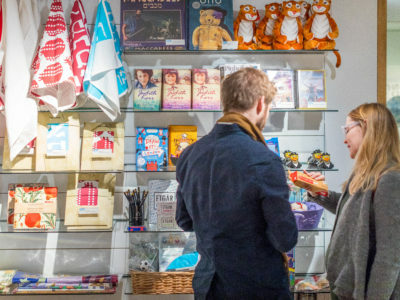 The Jewish Museum thanks its Exhibition Sponsors and Supporters Circle.